Scientists took one step closer to mimicking the biology of animals such as salamanders, which can regenerate entire limbs, through the creation of an induced multipotent stem (iMS) cell. It is conceivable that this new development could be used to repair everything from spinal discs to bone fractures and has the potential to transform current treatment approaches to regenerative medicine. There are numerous types of stem cells, such as embryonic stem (ES) cells, which during embryonic development generate every type of cell in the human body, and adult stem cells, which are tissue specific. Before the current study, there were no adult stem cells that could regenerate multiple tissue types. 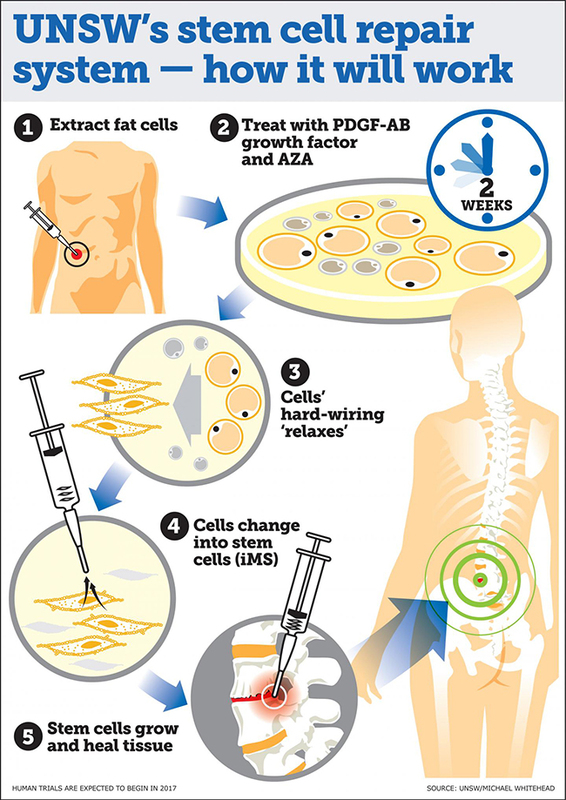 The UNSW investigators developed the technique by extracting adult human fat cells and treating them with the compound 5-azacytidine (AZA), along with platelet-derived growth factor-AB (PDGF-AB) for approximately 2 days. The cells are then treated with the growth factor alone for a further 2–3 weeks. AZA has been shown previously to induce cell plasticity—a crucial step in reprogramming cells. The AZA compound relaxes the hard wiring of the cell, which is expanded by the growth factor, transforming the bone and fat cells into iMS cells. When the stem cells are inserted into the damaged tissue site, they multiply, promoting growth and healing. This method represents an advance on other stem cell therapies being investigated, which have a number of deficiencies. Along with confirming that human adult fat cells reprogrammed into iMS stem cells can safely repair damaged tissue in mice, the researchers stated that further work is required to establish whether iMS cells remain dormant at the sites of transplantation and retain their capacity to proliferate on demand.